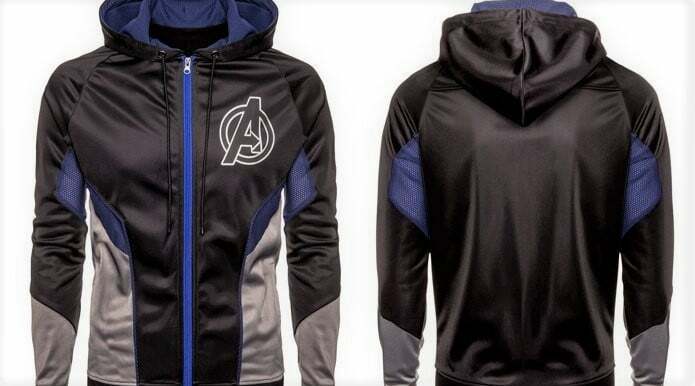 With the release of Avengers: Endgame around the corner, Marvel has now unveiled a brilliant hoodie that looks like it has been designed by Tony Stark himself. It features multiple meshes, panels and texture with a slick blue, black and gray colour scheme. The Avengers hoodie is available to pre-order from here for $59.99 with free shipping slated for May. This seems like the best kind of bargain for this good quality-hoodie, so it’s time you get yourself one of your size while you still can. Stock appears limited. The design of Merchoid Avengers hoodie follows the recent limited edition that Marvel has released in the past few days. The collection has a jacket that gives subtle bids to Cap’s iconic suit. This also has the star on Cap’s chest stitched on the front and his shield stitched at the back. There’s maroon shading on the arms and shield that just adds a bit of colour. The Captain America jacket is an exclusive by Merchoid that out for pre-order right here in all sizes, from S to XXXL for $119.99. All products are available with free shipping slated for July. The Captain America jacket is a limited edition, while there are many more jackets on sale. The one with Iron Spider, Spider-Man, and Black Panther can be ordered from here. Keep tabs on that link because it may also see more new merchandise tagged to Endgame coming soon. Avengers: Endgame will hit the theaters on April 26. Star Wars Collection is out too! There’s also a Star Wars: The Empire Strikes Back Han Solo Hoth-style jacket, if you spend $400 or more. This jacket was released by Columbia a year ago. However, a new officially licensed replica can be pre-ordered from Merchoid, with free shipping, by clicking here. This replica may not be as high tech as The Columbia version, but it’s not bad either. It will keep you as warm as anything, thanks to the faux fur lined good and double insulated body lining. It looks like perfect replica, though it has been confirmed that Hoth Coat Han Solo wore in Empire is actually brown, instead of blue. Even Columbia went for the blue colour with their version.